Shopping for furniture doesn’t have to be a chore, and you don’t have to spend a fortune to get high quality items for your home. In fact, if you live in Ohio, you can take a short drive to Westerville and visit the Amish Originals Furniture Co. showroom, where you will find beautiful furniture for every room in your home, at prices you can afford. This is the furniture store Columbus Ohio homeowners visit when they want to get high quality furniture. You could visit department stores or discount furniture stores, but you are not going to find the quality that you will find here. All items are handcrafted by the Amish, who take extreme pride in everything they do. This means that you can be sure that the furniture you buy is going to be durable and beautiful for many generations to come. Make sure that it is weatherproof: Many people just put any furniture items out in their yards, and then wonder why they are ruined after the first rain storm. Outdoor furniture is made to be outdoors, and it is treated so it won’t be damaged by rain and other bad weather. 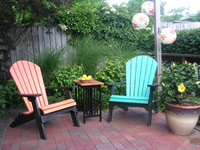 Outdoor items at Amish Originals Furniture Co., the furniture store Columbus Ohio homeowners go to for the best deals, are made from treated pine and poly lumber, and are ideal for outdoor conditions. Make sure it fits in your yard: If you have a small yard, you don’t want to clutter it up with too many items. A small set with a couple of chairs and a table with a swing is ideal for a small yard. Of course, if you have a large yard, the sky is the limit, and you have all kinds of options available to you at Amish Originals Furniture Co.
Make sure the items will be used: Don’t get items that are just going to sit there and look pretty. This furniture is made to be used, and will stand up to a lot of abuse. If you don’t need some pieces, don’t get them, no matter how much you like them. Just get what you need. You can always come back for more later on if you decide you want something else. If you live in the area and want to shop at a great furniture store Columbus Ohio is just a short drive away. Visit the showroom at 8 North State Street in Westerville and see all of the beautiful, high quality items available. You can also check out the website at www.amishoriginals.com.